Everett Nourse, a Bay Area theater organist whose career began while he was still a teenager, died January 31, 2000 of a stroke in a Vacaville hospital. Nourse, the last organist at San Francisco's Fox Theater, was 88. Born on June 8, 1911 in Chico, he grew up in Oakland and began playing the piano when he was six years old. Within two years he was composing his own music and at 14 he became enthralled by the Wurlitzer pipe organ at his neighborhood Parkway Theater. He began taking lessons, practicing in the Park Boulevard Presbyterian Church near his home, playing occasionally for the church and eventually giving his first public concert there when he was 16. After his Oakland High School music teacher arranged for his first chance at a Wurlitzer, demonstrating the organ in the Diamond Theater in Oakland, the theater's manager invited him back to play whenever he wished. He began playing occasionally for Saturday afternoon stage shows. From 1928 to 1934, Nourse played programs on several East Bay organs, and in 1935, he finally got to play the Fox Oakland downtown for a New Year's Eve singing program. But his career was mainly limited to the weekends when he entered the University of California at Berkeley in 1929, later getting a job with the U.S. Department of Agriculture in Berkeley. He married his wife, Louise, in 1936, and they moved to Vacaville where he worked as a farm adviser in Solano County. He took a leave to earn a master's of science in agronomy from University of California at Davis in 1957. Nourse continued to play the organ, performing at the Paramount Theater in Oakland and others around the Bay Area, finally landing the job as organist for the 5,000-seat Fox Theater in San Francisco in 1944, where he delighted audiences until the theater closed in 1963. During the first six years he was featured every Saturday night in the Fox Singtime Jamboree where he would often play to capacity audiences. In these Saturday night programs he would play several solo numbers which were followed by a 15-minute community sing with song slides on the screen. Nourse was also featured on special occasions such as world premiere showings where he would play the organ with Walt Roesner's theatre orchestra. The last show to be held was the fabulous Farewell to the Fox stage show on February 16, 1963 and Nourse played for a capacity audience that night, nostalgic songs of the 30s and 40s, the Fox's golden era. The actual last program to be played occurred the following night in the empty theatre, a stereo broadcast on station KPEN. This program featured both Nourse and Tiny James who played alternately. The closing song was San Francisco played by Nourse at the end of the broadcast. "He had the key job in this town," said Edward Mullins of San Francisco, secretary/treasurer of the Jesse Crawford Theater Organ Society. "It is kind of the end of an era. I'll remember him every time I play the records." Inducted into the American Theater Organ Society Hall of Fame in 1998, Nourse continued to play the organ at the Trinity Baptist Church in Vacaville and for the Vacaville Rotary Club until his death. "Sometimes he would get applause in church. He was well-loved," said his daughter, Jeanne Nourse, 52, of Sonoma. 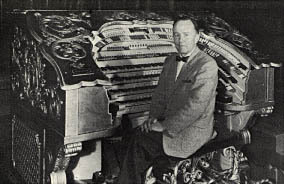 The grand Fox Wurlitzer organ that Everett Nourse played was installed last year in the El Capitan Theater in Hollywood by the Walt Disney Company.